Dana Point Festival of Whales Parade this March 3rd! Posted by Teresa Mihelic HelpDesk on Wednesday, February 15th, 2012 at 4:16pm. Once again, and a tradition for over forty years, the Dana Point Festival of Whales and Parade is about to begin! The much anticipated Parade is going to take place this coming Saturday March 3rd, starting at 10:00 am along Pacific Coast Highway, starting at Selva Road and finishing at Golden Lantern St. The Parade usually has giant floats, b allons, marching bands, and different schools representations,art exhibits, environmental activities , crafts, kids activities and food! Of course there's also whale watching excursions, or viewings from the Dana Point Headlands Conservation Center. That same day, there's going to be a free showing of the movie 'A Dolphin Tale', at 6:30pm, on the grass area in Baby Beach. Free popcorn, hot beverages and snacks will be available. Also, and this is extremely cool, there's different concerts on land and water, with a special one at Baby Beach on Sunday March 11th, the 'Whale of a Concert'. 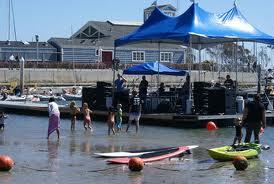 This concert is free, with bands performing on the water on a special floating stage. People bring their chairs, beach towels and dance to the music, with the opportunity to purchase different BBQ foods and drinks. Bands performing include "Tijuana Dogs', 'Lights-Journey Tribute'and the 'Chicago Tribute Academy'. All of the activities are presented by the City of Dana Point in collaboration with the Dana Point Chamber of Commerce, the Dana Point Harbor Association and other local sponsors. And if you feel like you would like to see some homes, we are ready to help you! Come, enjoy the festival, and then let's look at the homes in Dana Point available for sale.